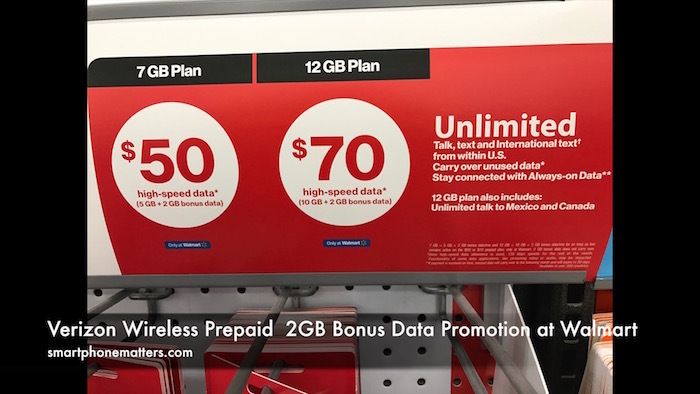 Today I wanted to tell you about the special Verizon Wireless Prepaid promotion currently going on at Walmart. Back in November of 2016, Verizon Prepaid launched their $50 5GB and $70 10GB plans. Those plans are a great value if you want to use the Verizon network. Shortly after a number of viewers started telling me about a special promotion in store at Walmart. Sign up for Verizon Prepaid at Walmart and you’ll get an extra 2GB of high speed data per month added to your account. This brings the plans to $50 for 7GB and $70 for 12GB. I finally got a chance to visit Walmart, and yes the special promotion is clearly displayed in the prepaid wireless section of the Electronics department. I took a few photos of the signs, and in fact when leaving the store I noticed they even had a sign outside in front of the store. If you look carefully at the fine print on the sign you’ll see the terms and conditions to of the offer. The extra 2GB bonus data offer is only available at Walmart. You’ll continue to receive that bonus data as long as the account is active. It also looks like that bonus data will not be included in your carry over data. Now before going forward a big thanks to those of you who have been sharing info and your experience with this promotion in the comments. I appreciate it. Based on the comments, it seems this is a limited time offer that may end in April 2017. Now it also seems that if you want to sign up for a BYOP / BYOD plan you’ll need to call Verizon to make sure you get the extra data. Now, to do BYOP, you’ll need a SIM kit and it seems the one they sell in store comes with a 2GB plan. One commenter said he needed to call Verizon and paid an extra $5 and was able to get on the 7GB plan $50 plan. One commenter suggested ordering just the sim from walmart.com. I haven’t tried it. I don’t know if this offer applies to online orders and when I checked walmart.com, the only verizon SIM for sale on walmart.com is from another seller. I really wish they would offer Verizon SIM only kits in the store so you can sign up for the plan you want. To me it looks like Walmart and Verizon are focused on selling phones along with the plans. If we take a look again at verizonwireless.com/prepaid, we’ll see they also have a 2GB $40 plan. If you don’t need more that 2GB of data, signing up for this plan could save you $120 to $240 a year. Walmart didn’t have any promotions on this plan, but if you don’t regularly need more than 2GB per month, save the money. It looks like the 2GB plan also has carryover data and you can buy extra data if you need it. If you don’t need more than 5GB or 10GB per month, check your local Verizon store and see if they will offer some credits or incentives to switch to Verizon prepaid. If your a heavy data user, this Walmart 2GB bonus data promotion is hard to beat. Finally if you sign up for the 2GB plan or don’t want to go to Walmart, I have some affiliate links below. If you use the affiliate link below when you sign up for Verizon Wireless Prepaid you’ll be helping to support smartphonematters.com at no additional cost to you.